This 600 board foot closed cell spray foam insulation covers 600 square feet at 1 inch thick. 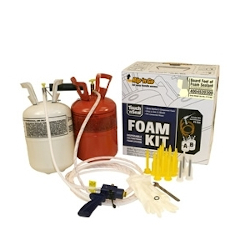 It is a complete kit with dispensing gun and hose, applicator nozzles, gloves - everything you need for your spray foam insulation job. Shipping Rates will vary depending upon the region of the country. They will range between these amounts for the specified number of units. When the Touch 'N Seal Foam mix is sprayed onto your walls, floors and ceilings, the shell of your home becomes protected. It's this protection that blocks heat gain in the summer and heat loss in the winter, thus preventing dramatic temperatures changes in the home. Correctly installed, insulation delivers comfort and lower energy bills during the hottest and coldest times of the year. Additionally, the Touch 'N Seal Foam (200 and 600) also come in a regular formula.